In the span of just a few short years, the rapid advance of modern technology has changed the face of business and commerce forever. Computers and automated systems have given rise to new forms of trade never dreamed of in days gone by. 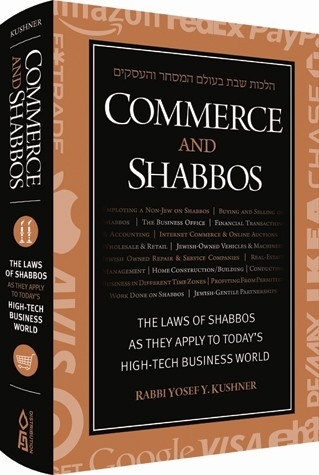 But these new business methods have also brought a host of Shabbos-related halachic questions not clearly addressed by Poskim of the previous generation. • Is one permitted to list an item on ebay if the auction is scheduled to conclude on Shabbos? 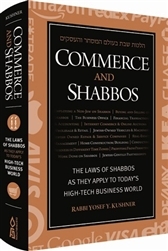 • May one allow his e-commerce website to remain open on Shabbos? • What should be done if one cannot possibly close his business on Shabbos, such as a nursing home or a store in a mall? • Must one close his business in a different time zone once it is Shabbos in his location? These issues, as well as hundreds of others, are discussed in a relevant, clear and concise way with all final rulings based on the original rulings of Rav Shlomo Miller. With its clear, down-to-earth style, as well as its extensive source material in the footnotes, this important work provides informative answers for both the inquiring businessman as well as the accomplished scholar.